One of the most difficult decisions that I faced when designing my kitchen was deciding what type of microwave that I wanted, and where exactly I wanted to place it. It is such a large and yet important appliance; still many people struggle with this decision. Which is best? Countertop? Drawer? Convection? Over-the-range? And where exactly is the best location? It’s enough to cause a major migraine. Well, the simplest answer is that there is no one correct answer. So instead, let’s just break down the pros and cons for each. Pros: One of the latest trends is the microwave drawer. The placement is usually just beneath the countertop, which makes it very easy to access. You don’t have to worry about having hot soup or drinks spill onto your hands because you can’t see over the tops of the containers. With these, you see exactly what’s going on. This is a plus if you have younger children that often use the microwave. Also, it is much easier to clean up a drawer than it is to reach back into a standard microwave. Cons: These are relatively expensive, and only come in the mid to high-end brands. They also provide an enticing feature for little fingers. Something to consider if you have very young children that would enjoy beeping buttons. (However, most of these do come with a child safety door lock). 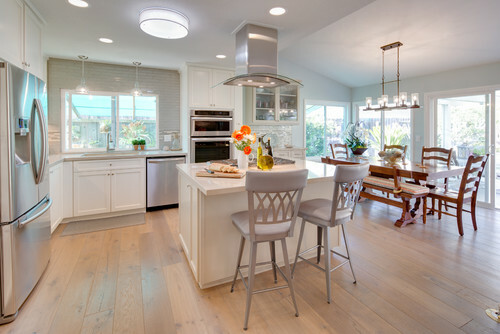 Traditional Kitchen by North Oaks General Contractors Bob Michels Construction, Inc.
Pros: This is probably going to be the most economical choice, but most people don’t really want to have a large appliance sitting on the counter. There are options though. 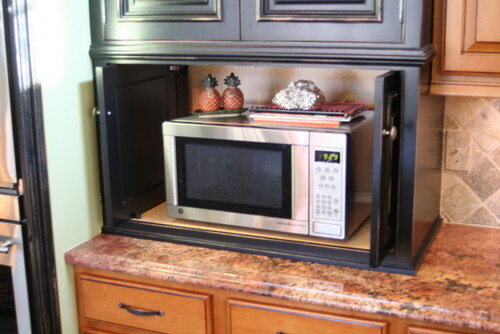 A customized cabinet can provide a nice home for a countertop microwave. Another option is to add a large appliance garage to hide the microwave. Regardless of how a countertop is incorporated into the design, it offers the perfect height for most. It is high enough to keep the little ones from accesses it, but not so high as to prevent the older kids from having ease of use. Cons: A countertop microwave takes up a lot of countertop space, and if you end up customizing the cabinets to fit this style, you will cancel out the savings that would have otherwise been realized. 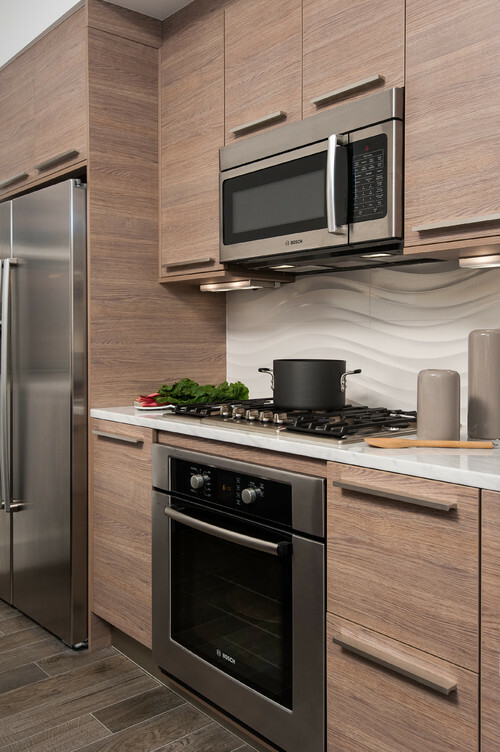 Pros: With an over-the-range hood, you get the benefits of both a microwave and a vent hood. Because these two features are combined, the space savings can be a plus. There is no concern with small children playing with this type of microwave, because it is outside of their reach. Cons: Even though over-the-range hoods take the place of a vent hood, don’t expect to get odors vented to the outside. These will only filter the air and recycle it back into your home. They can also be difficult for younger children and shorter people to use. Being one of those in that “shorter” category, I am not really a fan of this type of microwave. But if that’s not the case for you, then perhaps an over-the-range hood fits your needs. Pros: This is another one of those trending designs. If you are tight for space, this combination could serve you well. Most cabinet manufactures provide the cabinets for these in standard sizes, so there is typically not a customized expense, with the exception of custom finishes. Usually, these microwaves come as a microwave/convection oven. Which means, you get the benefit of both a microwave and an oven. Cons: If you want the standard in-wall double ovens, you would need to have the extra space to spare, in order to have an in-wall microwave. If there is not enough wall space to have both double ovens and this type of microwave, you may find this set-up a bit disappointing. The interior of the microwave is quite small for everyday oven needs. So, you should be prepared to have this function as a one-oven kitchen. Pros: Not to be left out of the mix, the hanging microwaves come in handy for many situations. This space saving under-mount fits nicely beneath these rather narrow cabinets, and is relatively inexpensive. It gets the microwave up off the countertop, leaving some much needed work space. In smaller kitchens or kitchenettes, a hanging microwave can mean the difference between having a microwave or not having one. Cons: These are not as child friendly as the drawer microwaves, and many may find them unattractive if not wrapped within an enclosure. 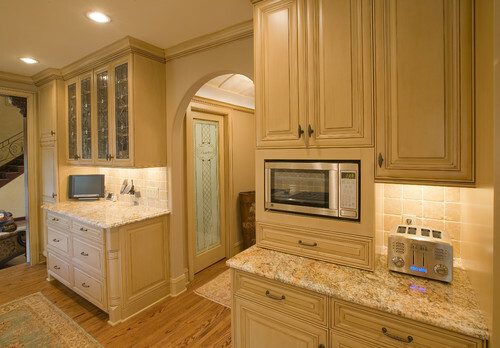 There are many microwave location options, as well as many different types of microwaves. Hopefully, this article has helped with anyone struggling to make a decision. I personally prefer the drawer microwaves, but every person is different, as are their needs. So, what do you think? Do you have any other ideas for microwave placement? On your comment of the over the range microwave and hood combo; you said it could only recycle the air back into the kitchen. I have installed many of these and they all had the option to vent outside as well. You are right though, I don’t really like these either, mostly because they are not very good at venting.